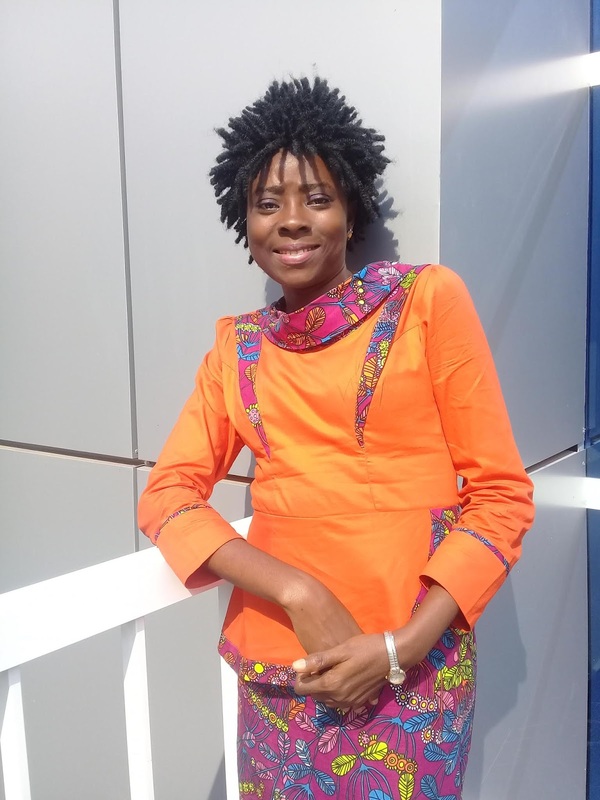 Arrey-Echi is an avid blogger and writer on sickle cell and other social issues. As a sickle cell warrior, she blogs about her experience in a bid to educate people and dispel myths and stigmas about sickle cell and also, to empower other sickle cell warriors. She is also passionate about gender and disability issues. She tells us her story in her own words. I was diagnosed with sickle cell at the age of 2. Even so,I would say I had a very normal childhood. I grew up surrounded by love and good care. I played like any other child, had my own naughty moments and all that comes with being naughty. Apart from the pains which usually saw me in and out of the hospital, life was really great. My family made sure of that. While trying to help me understand what I was up to, they also made me understand they will always be my biggest fans and cheerleaders and for this, I have always been very grateful. That doesn’t mean our family was picture perfect. We had our own little fights like any other family, but the love and support has always been evident. That love and support has in one way or another, contributed to the confident woman I am today. I enjoyed schooling and reading books. Books became my early companions because where I didn’t have the stamina to play, I buried my head in any available books and let my imagination soar. My dad usually accompanied me to school every start of the academic year to explain my condition to the school authorities, especially when I was in primary school. Most of my teachers were understanding and supportive, some were not. I believe I was a good student too. I made some great friends who have remained very supportive till date. However, not all was rosy. It was during my school days that I started experiencing stigmatization and discrimination especially from some class mates. I was called half die and when it was realized that I couldn’t hear well as I lost most of my hearing at a young age, some also called me mumu; a derogatory term used for people who are deaf or hearing impaired. My family’s love and assurance and the support from some of my few friends made it easy to deal with that stigma and discrimination. Yet, it was not funny. I may use those words today in some of my write ups to drive home a point, but back then, I didn’t find them funny. Education was fun. I love learning but it didn’t come without its challenges. Being away from school most of the time because I was battling life in hospitals meant I missed out a lot and always had a lot of catching up to do. Being hearing impaired also meant I missed out much even when I was in class because there were no special provisions for persons with disabilities. I usually relied on bench mates for notes and that means I risked copying wrong notes. What helped was the instilled value to always read ahead of time and also the understanding and support from some of my teachers and friends who tried their best to make sure I had the right notes and followed up during lectures, especially during my university days. Growing up was fun. It had its own challenges as mentioned above but I had a very normal childhood and many beautiful memories. I learnt to cook, do all the normal stuff every child does. I am 6th in a family of 7 and the only one of my siblings with sickle cell. My parents and siblings made the childhood journey worthwhile with their love and support till date and I remain more than grateful for that. It gives me the sanity and assurance that life is still beautiful and worth living and keeps me fighting even as I deal with sometimes indescribable and excruciating pains. understanding what I was up to back then. My parents and siblings knew very little about sickle cell during those early days but they say where there is love, there is always a way. And so, they did all they could to learn how to manage the condition and take care of me. I was fortunate to have some doctors knowledgeable in sickle cell who told my parents what to do to ensure I stay healthy and as far away from the hospital as possible. In my childhood community, we lived with neighbours who strongly believed that a child belongs to them all as such; my parents’ worries about me were equally their worries. I don’t know if there were ever some whispered words about me being a cursed child with the numerous hospital trips and stays, sometimes being rushed to the hospital even in the dead of night. What I do remember is that our small community was supportive. They visited me in the hospital, cooked for me, helped to massage me and dry away my tears. They didn’t exactly understand everything about sickle cell, but they did their best along with my family- both the immediate and extended family- to make sure life was good and bearable. I can only say, I feel truly blessed, I know not many with sickle cell were that fortunate, even today to have that love and support we mostly need especially in a superstitious society which attributes anything not understandable to witchcraft . Most of my encounters with stigma and discrimination happened far away from my immediate support system. 1 Well, I have always loved writing and I have many who have encouraged me to write more, create a blog or just anything to get my writings out there. I can’t say I was particularly excited to buy into their well-meaning ideas. Maybe I was also not ready; I needed something that could keep me on it once I started. However, after one particular Facebook Post I madeon Sickle Cell and Stigma around 2015 and the negative comments on sickle cell even from some well educated people, I knew that the ignorance is contributing a lot to stigma, discrimination and all sorts of misconceptions about people living with sickle cell. The more I read the comments, the more I felt this strong desire to do something to help change the narrative and perceptions about sickle cell and hopefully, help educate others on sickle cell. That was what inspired me to take up the challenge and accept the encouragements I have been given to blog. Joy2Endure was thus born. There were a few who didn’t find the name fancy for a blog. Still, there is a lot behind this name and maybe one day, I will write about it but suffice it to say it was the only name I found descriptive enough for my purpose because it summed my life in three simple yet profound words. That is the genesis of Joy2Endure, using my experiences to debunk myths and demystify sickle cell. The primary challenge was making my life a public book. It was not easy being vulnerable and making the world know I live with sickle cell. There was no shame about it on my part and there were a few friends apart from family, who already knew about it. Nonetheless, I live in a culture where there’s some kind of revered silence around sickle cell due to the taboo and stigma associated with it. People do all they could to hide it and only speak about it in whispers. I had second, third thoughts and eventually, I told myself we have to tell our own stories if we want to stop the stigma, discriminations and misconceptions around our condition and it has to start from somewhere. That is what helped me muster the courage to post my first article on the blog, talking about my life with sickle cell. I call it the moment of revelation. Getting people to read was another challenge. I think I was the only one talking sickle cell in our blogging community. It was difficult to get people leave fashion, food, sports, etc., to read a thing on sickle cell. Being persistent has helped me overcome these challenges. I kept on writing and gradually, the posts started getting the interests of others. Around that period too, I did the Voices of The Future program on World Pulse. 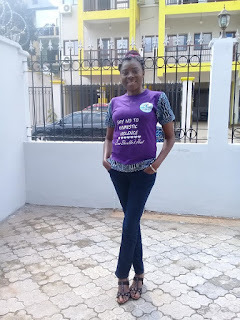 With ideas from that program, I added the #BreakTheSilence…BeASickleCellVoicecolour awareness campaign to my blogging to raise awareness on sickle cell. I do this mostly in June as events leading up to June 19th which is World Sickle Cell Day are high in most places around the world. Basically, I wear shades of red and black which are sickle cell colours the whole of June, take a picture and write something or two about sickle cell and post it on Facebook, Instagram etc. This has been a great success as there have been a lot of positive feedbacks from others and more people join me yearly during June to help paint Social Media red/black for sickle cell warriors. The primary aim was just to write and demystify misconceptions about sickle cell and also to help raise awareness on sickle cell and the challenges people living with sickle cell face. However, as the years go by and I started organizing workshops, advocacy and other programs for sickle cell warriors and the community at large, I came to realize that there is so much ignorance and misconceptions out there and inadequate information on care and management, which continue to make people living with sickle cell and their families suffer unnecessarily. I hope that the “BreakTheSilence…BeASickleCellVoice” becomes more than just a campaign theme. I hope it would one day become a movement in which more and more people freely talk about sickle cell without shame and fear. I dream about a foundation and a hospital dedicated to sickle cell care, management and research. I also hope to be able to spread the awareness, sensitization and education nationwide and why not, globally. Lofty dreams maybe but I have been told if your dreams are not big enough to scare you, you need to keep dreaming ;) ;). To achieve all these, I would need a lot of human and financial resources and that is where every little help would go a long way. I can’t really say I have met much resistance, except maybe trying to get as many warriors as possible to join me speak out and not wallow in shame and silence for something they are not responsible for. I understand the stigma and taboos stops many but I am happy for the few who are slowly but surely speaking out. I always try to emphasize that it is all about breaking the silence and taboo, the more we stay quiet and hide it, the more these stifle us. Also, after the initial starts and fears, I get a lot of support and encouragement from the many people who follow my activities. The supports have come in various ways from moral to financial, helping in carrying out most of my activities. No support has been too small and I really appreciate it all. Each day I wake up pain free and happy keeps me inspired and thankful to do something different for the day no matter how small. It is a constant reminder that my case is different; a testament to the fact that life may have dealt us pains but it is up to us to determine if we wish that pain to make or mar us; if we wish to turn that pain into purpose or pity and finally, if we wish to take life as it comes and make the most out of it or wallow in self-pity and continuously cry why me. I am grateful for each new day and I feel inspired by that gratitude to do something different. Getting positive feedback from others especially from people across the world I have never really met and being able to cheer another warrior or parent with a warrior on keeps me going along with faith, hope, love and gratitude. It makes it all worthwhile putting my life out there and serves as an encore to press on. But above all; the desire to demystify sickle cell, break the stigma and taboos and make life as comfortable as possible for people living with sickle cell remains my biggest drive. Do you want to help, too? Thank you for asking again how others can help. In question five above, I highlight some of the dreams I have as I press forward. However, there are some immediate areas where support both human and financial would equally go a long way. For instance, I meet some warriors who have difficulties getting the essential medications especially pain killers. It is difficult to listen to them without being able to help them all the time. Getting the means to get these essential medications to those really in need could be great. We have plans to make gadgets and other things like tracts to give out as a way to raise awareness about sickle cell. Some may be given for free or sold at cheaper rates to raise more cash for future projects. This also will require some form of human and financial support to materialize. As we get to organizing more workshops on sickle cell for the community at large, large scale sensitization programs like walks for sickle cell etc and other fun activities such as picnics for warriors especially, we need equipment like projector, roll ups and any kind of moral, human and financial support to see them successfully go through. I think as the years go through, more inspirations and areas where others can help will also hopefully come in but these are some of the areas where help will be equally appreciated. And of course, let more people join us talk sickle cell, make the effort to understand our unique battle, show some empathy and love to warriors. My experience has shown that even with the best of care, support and love, people living with sickle cell are not immune to stigma. You may have all the love and support at home but you will most definitely meet individuals out there who will discriminate against you. People who will weigh your ability to succeed through life and meet your full potential be it at school, work, relationships etc, by focusing on your health condition and not on the individual you are or the skills you possess. For as long as these misconceptions prevail, life will remain difficult for many sickle cell warriors and their families. That is why we need to continuously speak out in whatever avenue both the field and technology brings closer to us. It is all about #BreakingTheSilence to BeASickleCellVoice.